Bebop and Rocksteady used to be human, and part of a street gang in New York City that was employed by Shredder. Rocksteady was originally a short and stocky blond Caucasian man (who sported army camouflage pants that would be replaced with simple beige pants later while also occasionally sporting an army helmet in his mutated form) while Bebop was a taller African American man with a purple mohawk. With other members of their gang, they were sent out to stop a Channel 6 reporter named April O'Neil from doing a report about crime in the city. April ran down into the sewers while being chased by the street gang and met the Teenage Mutant Ninja Turtles, who defeated the gang in a fight. After this humiliating setback, The Shredder developed a plan to defeat the Turtles by mutating members of this street gang, so that they would have abilities parallel to the Turtles'. Bebop and Rocksteady both volunteered to undergo the procedure (though neither was particularly aware of what it would entail) with the promise that it would let them get revenge on the Turtles. 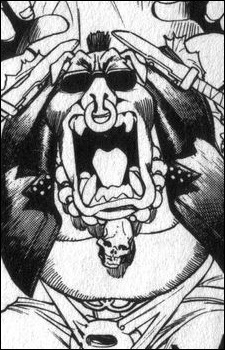 Bebop was mutated into a human warthog, and Rocksteady into a rhinoceros. However, though the transformation did make them larger and stronger, they remained incompetent simpletons, and were completely inept at stopping the Turtles or carrying out Shredder's plans. For example, in "Enter the Shredder" they charged at the Turtles, who jumped, and crashed into each other. Donatello commented that their mutations didn't "up their IQ's any." For most of the series they were employed for comic relief purposes. In one episode of the series, Bebop was shown to have kept a pet turtle, which got mutated into the evil turtle Slash.